The various sereis of the Dragon Ball franchise have each recently been introducing new concepts that could become big developments for the franchise's future. One of the biggest events currently happening is in the Dragon Ball Heroes promo anime, which has just seen Goku go through a major power-up. 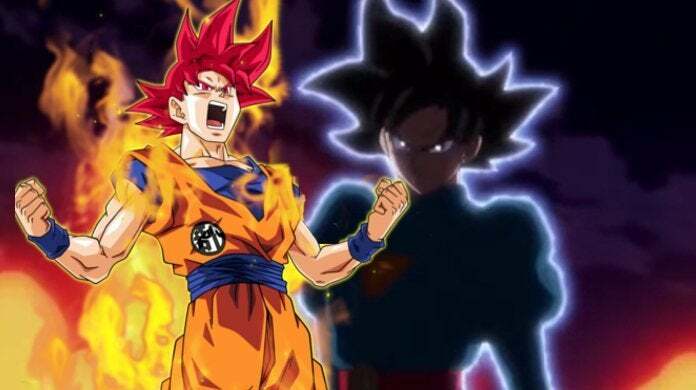 During Dragon Ball Heroes' current Universal Conflict Arc, Goku received new training from the Grand Priest that has allowed him to tap back into his Ultra Instinct power from Dragon Ball Super's Tournament of Power Arc - only this time with much more control and finesse over the milder "Omen" form of the technique. The return of Ultra Instinct Omen has stirred the Dragon Ball fanbase, and the subsequent discussion has led to a growing theory about a connection between Ultra Instinct Omen and Super Saiyan God. The proposed connection between SSG and UIO has primarily been inspired by Dragon Ball Heroes' depiction of UI. When "Grand Priest Goku" made his debut in the latest DBH episode, the version of Ultra Instinct Omen he unleashed on the battlefield was definitely one that balanced both offensive and defensive power. That's a big change from Ultra Instinct Omen's debut during Dragon Ball Super's Tournament of Power arc. When we first saw UIO, Goku could only use the technique defensively, before eventually accessing both the offensive and defensive powers of a fully mastered Ultra Instinct. Many fans thought that Ultra Instinct Omen, by its nature, was just a defensive power, but Dragon Ball Heroes clearly posits that this is not the case. Grand Priest seems to have taught Goku to improve Ultra Instinct Omen by gaining more control and stamina, with less negative impact to his body than the power burnouts he suffered during the Tournament of Power. In that sense, a lot of Dragon Ball fans are now thinking that Ultra Instinct Omen will be to Ultra Instinct what Super Saiyan God is to Super Saiyan Blue - i.e., a powerful transformation that comes with a milder stage of use. For comparison: Super Saiyan God wasn't eliminated by the debut of the more powerful Super Saiyan Blue. That's because Goku and Vegeta have had several occasions where the power of their SSG ki was required, without the intense power drain and limited time of Super Saiyan Blue. While this new form of Ultra Instinct Omen is making its debut in the very non-canon Dragon Ball Heroes promo anime, there are quite of a few indications that Goku learning better control over Ultra Instinct is a major development that could factor into the full canon storyline of Dragon Ball Super. Especially if Dragon Ball Super's new villain, Planet-Eater Moro continues to successfully shut down Super Saiyan, and eventually breaks Goku and Vegeta's godly ki abilities, as well. What do you think: Is Ultra Instinct Omen the new Super Saiyan God? Let us know your thoughts in the comments!